Cory Channon, Assistant Director -CSO/Canada, second from right, with, l. to r., Global Carbon Capture and Storage Institute Client Engagement Manager Jamie Burrows, CEO Brad Page, and Advocacy and Communications General Manager Guloren Turan; and Global, Municipal, Boilermaker and Allied Trade Union National Officer Stuart Fegan. 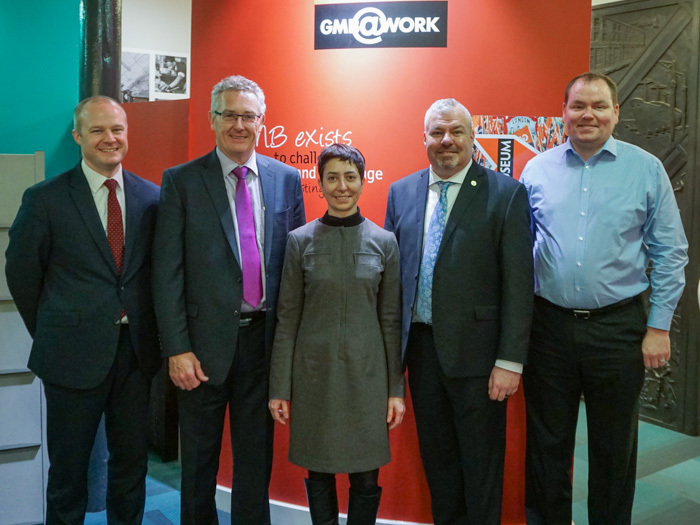 Cory Channon, AD-CSO/Canada, was instrumental in bringing together Stuart Fegan, GMB National Officer; and GCCSI leadership, including Brad Page, CEO; Jamie Burrows, Client Engagement Manager; and Guloren Turan, Advocacy and Communications General Manager. Their discussion focused on how CCUS technology can help grow a new energy economy that builds and maintains stable, skilled jobs and how the three groups can work to promote global adoption of CCUS. Founded in 1889 and based in London, GMB has more than 620,000 members in the commercial, manufacturing and public service sectors, with up to 200,000 of them affected by evolving climate change technology. The UK is striving for “net-zero” emissions, which means that in addition to cleaning carbon from emissions prior to release, additional carbon that currently exists in the atmosphere must be captured as well. The UK’s Energy and Clean Growth Minister announced development of the world’s first “net-zero carbon” cluster of heavy industry by 2040. And designs are being developed for a zero-emissions hydrogen train for use on British railways that could be operating as soon as 2022. Celebrating its 10th anniversary this year, the Melbourne-headquartered Global Carbon Capture and Storage Institute’s mission is to “… accelerate the deployment and commercial viability of carbon capture and storage globally, and advocate for CCS as a crucial component in a portfolio of technologies required to reduce greenhouse gases.” The IBB is one of over 50 members of the institute, which also includes governments, global corporations, private companies, research bodies and non-governmental organizations.